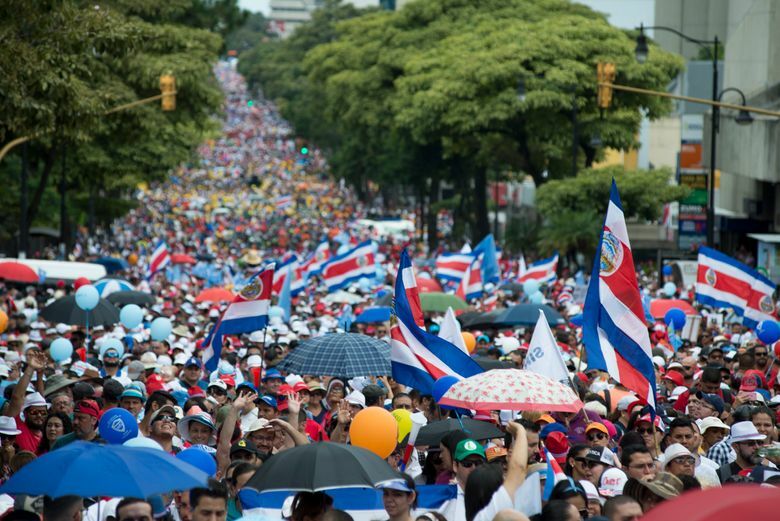 SAN JOSE, Costa Rica (AP) — Thousands marching in the streets. Flaming barricades. Clashes between demonstrators and riot police in darkened streets. A semi-truck hollowed out by fire. Costa Rica’s government is struggling with a deficit estimated at 7.1 percent of GDP this year, which has pushed up the public debt load and increased its need for revenue. “Here are the people demanding no more taxes on the working class, no more burdens on workers,” said Melida Cedeno, president of the APSE teacher union. Ahead of the strike’s start Monday, Alvarado ordered police to reinforce ports and oil installations to keep protesters from disrupting commercial activity and fuel distribution. Authorities confirmed Friday that they were investigating the death of a 17-year-old in Limon as possibly related to the disturbances. The same day, roadblocks forced the suspension of the annual bearing of a torch to mark the eve of the country’s independence day. “The bill has resisted a week of strike, the motions continue to be processed quickly and there have been no signs of any willingness to negotiate,” Araya said. “Under this panorama I would expect one more week” of protests.